If you are familiar with my work, you already know what I'm going to say about Andreas Lubitz, the co-pilot who commandeered Germanwings Flight 4U9525 this week and deliberately crashed it, killing all aboard. 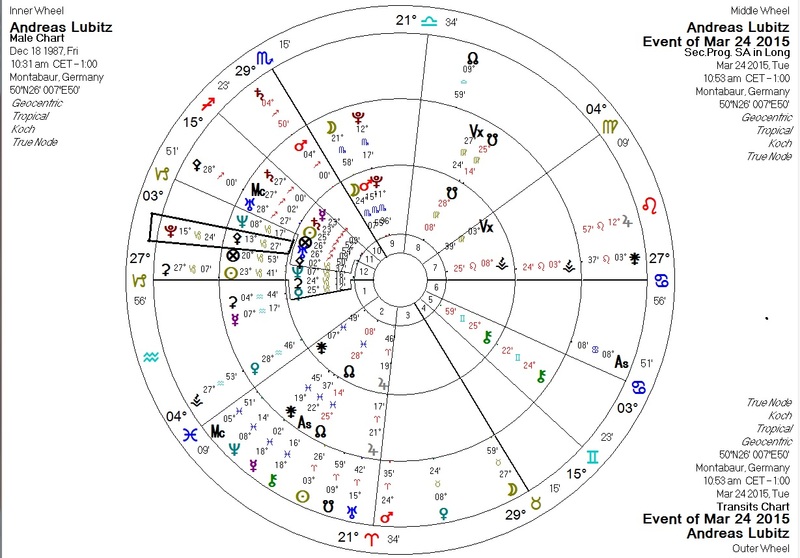 You already know I'm going to point out the presence of the Bloodbath Formula on Lubitz's chart, and that the transits for his crime will show transiting Pluto in aspect to his natal and/or progressed Pallas. 1. Pallas septile Pluto; Pallas ruler Saturn novile Pluto. 2. Pisces rules the Second House. 4. Moon ruled by and widely conjunct Pluto. I tend to notice Moon-Saturn-Pluto connections in charts of those with issues like depression or bipolar disorder. Lubitz has Pluto ruling and widely conjunct Moon, Pluto novile Saturn, and Moon parallel Saturn. 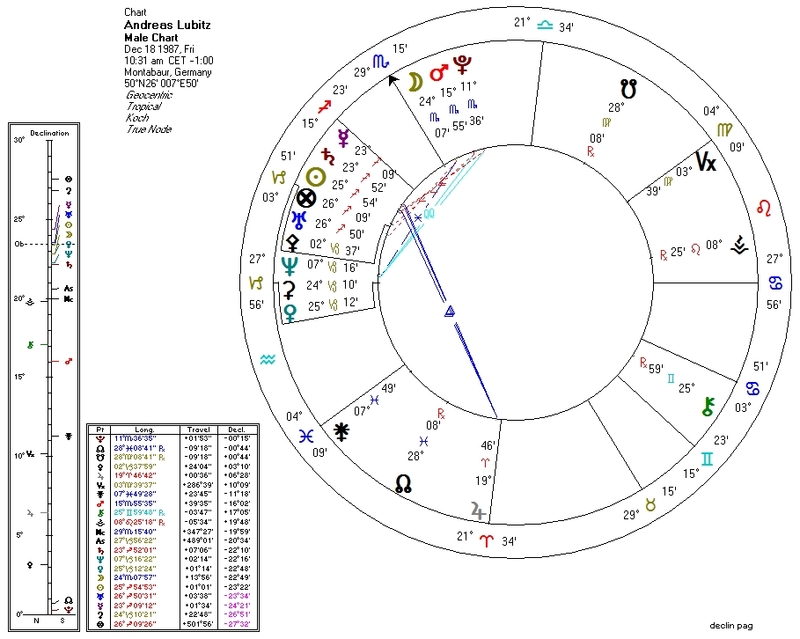 Here is the Pluto-to-Pallas connection that always seems to appear on the killer's chart during mass-murder events (in this case transiting Pluto conjunct progressed Pallas). We also have transiting Jupiter quincunx progressed Pallas (consistent with suicide along with the Pluto transit). These days, spree-killers tend to be on SSRI's or other government-approved mind-altering medication prescribed by a psychiatrist. So it should not surprise us should we learn that Lubitz's psychiatrist had prescribed such drugs to his unfortunate patient. Pallas is the astrological opposite of evil... as we continually learn from the evil events that occur when Pallas is compromised by transit, usually from Pluto. Of course, if we were to take the next logical step and declare Pallas to be the astrological ruler of "good", we might then be forced to conclude that libertarians (the astrological children of Pallas, as confirmed by my research) would represent that which in the political world is most "good". God forbid.